Rated: PG-13 Intense sequences of action and violence, some disturbing images and language. 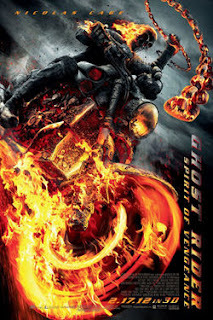 SYNOPSIS: Johnny Blaze, the human vessel for the demonic Ghost Rider, lives off the radar in Eastern Europe in an attempt to contain and purge the Spirit of Vengeance. When he is called upon to stop the devil from taking human form on earth, Blaze must let the Ghost Rider loose to battle the demon in exchange for ridding himself of the Ghost Rider curse for good. REVIEW: The Crank and Gamer directing team Mark Neveldine and Brian Taylor return with their extreme directing and aggressive cinematic style for one of the fringe, but surprisingly powerful, Marvel Comics characters. Based on a story from David S. Goyer (The Dark Knight, Blade), Scott M. Gimple (FlashForward, Chase) and Seth Hoffman (Prison Break, FlashForward) join Goyer on writing duties to bring the motorcycle-riding, flaming-skulled chain-wielding spirit of vengeance back into the popularity it deserves. Can the writing team lead by Goyer, directed by the Neveldine/Taylor extreme team, and reprised by Nicolas Cage do for Ghost Rider what Goyer, Norrington and Snipes did for another fringe Marvel character - vampire hunter Blade? In the first Ghost Rider, motorcycle circus stuntman Johnny Blaze (Nicolas Cage, Drive Angry 3D) sells his soul to the devil in order to save his father's life. As with every contract with Lucifer, the small print does not keep Blaze's father from death, only the cancer that was killing him. Years later Blaze suddenly becomes host to the demonic flaming Ghost Rider, an unstoppable engine of vengeance that looks to dish out justice against criminals and demons alike. In Ghost Rider: Spirit of Vengeance, Johnny Blaze has escapes to Eastern Europe in an attempt to keep the Ghost Rider contained within him. Buy removing himself from reach of criminals and the seedy underbelly elements, Blaze is able to keep the demon from forcing itself out to mettle out vengeance. When a young boy Danny (Fergus Riordan, I Want to be a Soldier) and his mother Nadya (Violante Placido, The American) under the care of a an ancient religious order are attacked by gunrunner Ray Carrigan (Johnny Whitworth, Limitless) and a group of mercenaries, mother and son escape and fall off the radar from both friend and foe. Alcoholic ex-priest Moreau (Idris Elba, Thor) tracks down Johnny Blaze with the promise of removing the Ghost Rider curse if Blaze releases the Ghost Rider to hunt down Danny in order to keep him safe from the devil Rourke (Ciarán Hinds, The Debt) who looks to transfer his own power and essence into the 13-year-old boy he helped to conceive. Mark Neveldine and Brian Taylor are a new breed of directors, with origins steeped in videos and low budget efforts that required innovative ways to 'get the shots'. Both have no qualms donning a pair of rollerblades, gripping the back of a pacing motorcycle, letting go and shooting the scene with a camera as they coast along at breakneck asphalt speeds without helmets. The same can be said for their take on this second entry of the Ghost Rider. The flaming skeleton rider may still don a leather jacket but gone are the shiny metal spikes and black cowhide material, instead replaced by charred and bubbling leather and an ever present length of hell chain. The Ghost Rider's gleaming skull replaced by a blackened smoldering cranium. Even the Ghost Rider's flames, emotive in the first film ranging from brilliant raging reds to subdued saddened blues are replaced by more dangerous yellow angry licks of flames laden with an oily black trailer smoke. 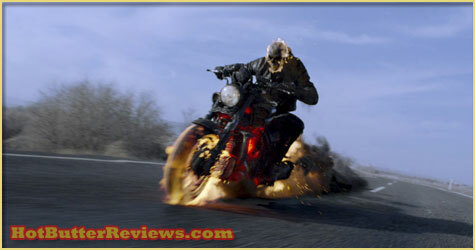 For the money, the Ghost Rider looks deadly, more gritty and darker than the demon that graced the screen in the Ghost Rider's first big screen appearance in 2007. The movie is as good as the first film, only completely different. The Ghost Rider is different, but visually cool. His powers are expanded, still using the chain but also able to 'hellify' any vehicle he commandeers. The Ghost Rider is more manic and crazy each time he is released from the confines of the human vessel Johnny Blaze. The setting is different, moving from the new glass and steel America to a history-rich stone Eastern Europe. Gone is the love interest in Eva Mendes' Roxanne, replaced by mother Nadya only interested in the safety of their son. Head demon Mephistopheles in the form of top salesman Peter Fonda and Wes Bentley's Blackheart are usurped by Ciaran Hinds' elder politican Roarke and Johnny Whitworth's Ray Carrigan who Roarke embodies with a fraction of power to become a creature able to decay anything he touches and create a perimeter field of total darkness to fight in (similar to the Marvel Comics Ghost Rider villain Blackout who used Ray Carrigan as an alias). And in Ghost Rider: Spirit of Vengeance, Highlander Christopher Lambert make an appearance as ancient order high priest Methodius tasked with keeping the boy safe with in his sanctuary. The story is decent, but still does not do the Ghost Rider the justice and showcase he deserves. The Ghost Rider may not be at the level of the Earth's Mightiest Avengers, but he routinely eliminates the hordes of hell. The best story may be a story that will never see the light of the screen, namely that of the Midnight Sons and the story of Lilith and the Lilan, including appearances by Blade, the Nightstalkers, Danny Ketch's Ghost Rider, a curse free Johnny Blaze, and the vampire Morbius. Not a direct war with the devil, that story would add more characters, tensioned interactions and alliances and a stable of grotesque killers and demons for the heroes to battle. Ghost Rider: Spirit of Vengeance is a camp-filled hell ride. Nicolas Cage is totally committed to the role of the tortured Johnny Blaze. Fergus Riordan plays Danny with both innocence and a killer stone cold glare. Both Elba and Whitworth are capable, working on opposite sides of the battlefield of good and evil. The 3D is not as impressive as it could be, leading to a recommendation to save a couple dollars by taking in a 2D viewing if possible. Comic fans will be torn by the departure from the source material, but being a second- or third-stringer in the Marvel Universe does allow for more latitude in the story. Appealing as a popcorn movie for action and some horror, Ghost Rider gets points for visual appeal, cool action sequences, and a better villain than in the first film. Otherwise, if you do not care for the Ghost Rider, please do not take your vengeance out of any of the reviewers. I agree about the 3D. Not worth the extra money. I did like the visual effects for the Ghost Rider and the display of Blackout's powers in action.